It has been a while since I’ve posted here. I’m thinking I may go back to a daily update for a stretch to keep the blogging muscle limber and trained. Over on other blog, [http://www.personalinfocloud.com](Personal InfoCloud) I have had a few more recent posts, but I have a very long backlog of content for that space as well. I need to rewrite the intro to the latest post there, [http://www.personalinfocloud.com/blog/2016/6/20/team-roles-needed-for-social-software-projects](Team Roles Needed for Social Software Projects). I also have a series there called [http://www.personalinfocloud.com/?category=Shift+Happened](Shift Happened) that I have at least 12 most posts that need to get written (edited, or more likely rewritten). The next two in the Shift Happened series are related to UX in enterprise software and services and the subject of Adaption. Both of these subjects could likely have more than one post each. The UX in enterprise needs a grounding / framing piece as many still think of UX as visual design and not things being designed for use (nor all the various roles and domains that make up successful UX design). The Adaption pieces need the framing of complexity and complex adaptive systems to get set as a footing, but also needs to frame how adaption works and enables being comfortable in an ever changing environment that we live in today. As well a focus on Adaptive Road Maps is needed as how one plans in an ever shifting and complex environment is needed when today’s road maps for the next 2 to 5 years are shot to pieces after a quarter or two. Having and maintaining a long focus on where a company or product is headed is really helpful, particularly when needing to understand foundation priorities needed for a long haul in a world were agile practices drive the day-to-day, but those agile practices are incredibly nearsighted and often discourage the long view (I’ve had a lot of work related discussions about this in the last 6 months or so as it is a common deep pain point for many). A common question is about health after the eColi issue in 2014 to early 2015. My health seems to be good. Getting through last winter’s holiday season had me on edge as I was partially expecting to fall ill again. Thankfully, I stayed healthy. Posted at 4:43 PM from Bethesda, Maryland. On Friday I had the pleasure of spending about an hour with two of my favorite people, Euan Semple and Megan Murray on the wonderful podcast, Shift. We covered tagging, taxonomies, meaning, power, and the future that we are all hurtling towards. I am a big fan of their interviews (as their conversations between them are familiar from past conversations between us) with other. I still have a few to get to. Posted at 6:09 PM from Bethesda, Maryland. There have been quite a few pieces lately on the importance of design and design leadership. The importance of design is getting to the true understanding of what the problems are and thinking about solving out from there without preconceptions of solutions, but letting solutions evolve form the need. Different and well fitting solutions often result from this approach, which is real innovtion and not copying someone else’s solutions for your use as innovation approach. Matt Milan’s “It’s never been more important for design firms to think differently” is the cornerstone for this thinking differently approach and its deep value. I’d add to this is knowing not only the current state of where the various mediums, systems, and devices are sitting, but where they are headed in the next year or two, so to openly plan for adaption and keep the potential integrations as open possibilities. Brian Zmijewski’s The Design Leadership Gap and Lead by Design are two really good pieces that take a look at the need for strong design leadership. Kai Brunner’s Is DevOps Driving the Future of UX Design? is a great look at how to mix and have success with design and DevOps. The two prodominant models don’t really work well and how to work to get to a more optimal model. Posted at 2:14 AM from Bethesda, Maryland. I spent much of this week at KM World 2014 in Washington, DC and the past few days I was working on notes and blog posts for here, but time to get them in readable form and posted wasn’t quite there, so today they became a Personal InfoCloud post, KM World 2014 is a Real Gem. I had a great time with fantastic people whom I’ve known and people new to me. I spent a lot of time talking about work projects and being back on the consulting side again, but also getting content out and what makes sense with prioritization. I had a lot of great meetings and less formal chats about the state of things as well as trying out some metaphors for framing some things to gage how well they hold up. I have a lot of snippets to explore and post that have come out of this past week, but I’m digging out of email, notes, snippets, and other things tucked away from this past week. One of my areas of focus is around social tools in the workplace (enterprise 2.0) is social bookmarking. Sadly, is does not have the reach it should as it and wiki (most enterprise focused wikis have collective voice pages (blogs) included now & enterprise blog tools have collaborative document pages (wikis). I focus a lot of my attention these days on what happens inside the organization’s firewall, as that is where their is incredible untapped potential for these tools to make a huge difference. One of the things I see on a regular basis is tagging interfaces on a wide variety of social tools, not just in social bookmarking. This is good, but also problematic as it leads to a need for a central tagging repository (more on this in a later piece). It is good as emergent and connective tag terms can be used to link items across tools and services, but that requires consistency and identity (identity is a must for tagging on any platform and it is left out of many tagging instances. This greatly decreases the value of tagging - this is also for another piece). There are differences across tools and services, which leads to problems of use and adoption within tools is tagging user interface (UI). The multi-term tag is one of the more helpful elements in tagging as it provides the capability to use related terms. These multi-term tags provide depth to understanding when keeping the related tag terms together. But the interfaces for doing this are more complex and confusing than they should be for human, as well as machine consumption. In the instance illustrated to the tag is comprised or two related terms: social and network. When the tool references the tag, it is looking at both parts as a tag set, which has a distinct meaning. The individual terms can be easily used for searches seeking either of those terms, but knowing the composition of the set, it is relatively easy for the service to offer up "social network" when a person seeks just social or network in a search query. One common hindrance with social bookmarking adoption is those familiar with it and fans of it for enterprise use point to Delicious, which has a couple huge drawbacks. The compound multi-term tag or disconnected multi-term tags is a deep drawback for most regular potential users (the second is lack of privacy for shared group items). Delicious breaks a basic construct in user focussed design: Tools should embrace human methods of interaction and not humans embracing tech constraints. Delicious is quite popular with those of us malleable in our approach to adopt a technology where we adapt our approach, but that percentage of potential people using the tools is quite thin as a percentage of the population.. Testing this concept takes very little time to prove. So, what are the options? Glad you asked. But, first a quick additional excursion into why this matters. One common hinderance for social tool adoption is most people intended to use the tools are missing the conceptual model for what these tools do, the value they offer, and how to personally benefit from these values. There are even change costs involved in moving from a tool that may not work for someone to something that has potential for drastically improved value. The "what it does", "what value it has", and "what situations" are high enough hurdles to cross, but they can be done with some ease by people who have deep knowledge of how to bridge these conceptual model gaps. What the tools must not do is increase hurdles for adoption by introducing foreign conceptual models into the understanding process. The Delicious model of multi-term tagging adds a very large conceptual barrier for many & it become problematic for even considering adoption. Optimally, Delicious should not be used alone as a means to introduce social bookmarking or tagging. We must remove the barriers to entry to these powerful offerings as much as we can as designers and developers. We know the value, we know the future, but we need to extend this. It must be done now, as later is too late and these tools will be written off as just as complex and cumbersome as their predecessors. If you are a buyer of these tools and services, this is you guideline for the minimum of what you should accept. There is much you should not accept. On this front, you need to push back. It is your money you are spending on the products, implementation, and people helping encourage adoption. Not pushing back on what is not acceptable will greatly hinder adoption and increase the costs for more people to ease the change and adoption processes. Both of these costs should not be acceptable to you. I am starting with what we know to be problematic for broad adoption for input. But, compound terms also create problems for search as well as click retrieval. There are two UI interaction patterns that happen with compound multi-term tags. The first is the terms are mashed together as a compound single word, as shown in this example from Delicious. The second is an emergent model for compound multi-term tags is using a term delimiter. These delimiters are often underlines ( _ ), dots ( . ), or hyphens ( - ). A multi-term tag such as "enterprise search" becomes "enterprise.search", "enterprise_search" and "enterprise-search". While these help visually they are less than optimal for reading. But, algorithmically this initially looks to be a simple solution, but it becomes more problematic. Some tools and services try to normalize the terms to identify similar and relevant items, which requires a little bit of work. The terms can be separated at their delimiters and used as properly separated terms, but since the systems are compound term centric more often than not the terms are compressed and have similar problems to the other approach. Another reason this is problematic is term delimiters can often have semantic relevance for tribal differentiation. This first surface terms when talking to social computing researchers using Delicious a few years ago. They pointed out that social.network, social_network, and social-network had quite different communities using the tags and often did not agree on underlying foundations for what the term meant. The people in the various communities self identified and stuck to their tribes use of the term differentiated by delimiter. The discovery that these variations were not fungible was an eye opener and quickly had me looking at other similar situations. I found this was not a one-off situation, but one with a fair amount of occurrence. When removing the delimiters between the terms the technologies removed the capability of understanding human variance and tribes. This method also breaks recommendation systems badly as well as hindering the capability of augmenting serendipity. So how do these tribes identify without these markers? Often they use additional tags to identity. 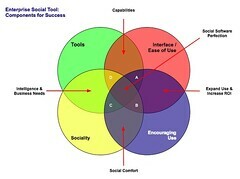 The social computing researchers add "social computing", marketing types add "marketing", etc. The tools then use their filtering by co-occurrence of tags to surface relevant information (yes, the ability to use co-occurrence is another tool essential). This additional tag addition help improve the service on the whole with disambiguation. The use of distinct and disconnected term tags is often the intent for space delimited sites like Delicious, but the emergent approach of mashing terms together out of need surfaced. Delicious did not intend to create mashed terms or delimited terms, Joshua Schachter created a great tool and the community adapted it to their needs. Tagging services are not new, as they have been around for more than two decades already, but how they are built, used, and platforms are quite different now. The common web interface for tagging has been single terms as tags with many tags applied to an object. What made folksonomy different from previous tagging was the inclusion of identity and a collective (not collaborative) voice that intelligent semantics can be applied to. The downside of disconnected terms in tagging is certainty of relevance between the terms, which leads to ambiguity. This discussion has been going on for more than a decade and builds upon semantic understanding in natural language processing. Did the tagger intend for a relationship between social & network or not. Tags out of the context of natural language constructs provide difficulties without some other construct for sense making around them. Additionally, the computational power needed to parse and pair potential relevant pairings is somethings that becomes prohibitive at scale. One of the methods that surfaced early in tagging interfaces was the quoted multi-term tags. This takes becomes #&039;research "social network" blog' so that the terms social network are bound together in the tool as one tag. The biggest problem is still on the human input side of things as this is yet again not a natural language construct. Systematically the downside is these break along single terms with quotes in many of the systems that have employed this method. Non-space delimiters between tags allows for multi-term tags to exist and with relative ease. Well, that is relative ease for those writing Western European languages that commonly use commas as a string separator. This method allows the system to grasp there are multi-term tags and the humans can input the information in a format that may be natural for them. Using natural language constructs helps provide the ability ease of adoption. It also helps provide a solid base for building a synonym repository in and/or around the tagging tools. While this is not optimal for all people because of variance in language constructs globally, it is a method that works well for a quasi-homogeneous population of people tagging. This also takes out much of the ambiguity computationally for information retrieval, which lowers computational resources needed for discernment. Lastly, the option for input is the text box per tag. This allows for multi-term tags in one text box. Using the tab button on the keyboard after entering a tag the person using this interface will jump down to the next empty text box and have the ability to input a term. I first started seeing this a few years ago in tagging interfaces tools developed in Central Europe and Asia. The Yahoo! Bookmarks 2 UI adopted this in a slightly different implementation than I had seen before, but works much the same (it is shown here). There are many variations of this type of interface surfacing and are having rather good adoption rates with people unfamiliar to tagging. This approach tied to facets has been deployed in Knowledge Plaza by Whatever s/a and works wonderfully. All of the benefits of comma delimited multi-term tag interfaces apply, but with the added benefit of having this interface work internationally. International usage not only helps build synonym resources but eases language translation as well, which is particularly helpful for capturing international variance on business or emergent terms. This content has come from more than four years of research and discussions with people using tools, both inside enterprise and using consumer web tools. As enterprise moves more quickly toward more cost effective tools for capturing and connecting information, they are aware of not only the value of social tools, but tools that get out the way and allow humans to capture, share, and interact in a manner that is as natural as possible with the tools getting smart, not humans having to adopt technology patterns. This is a syndicated version of the same post at Optimizing Tagging UI for People & Search :: Personal InfoCloud that has moderated comments available. Posted at 8:44 AM from Bethesda, Maryland. Posted at 5:21 AM from Bethesda, Maryland. Under a month from now I have the wonderful pleasure of speaking at the International Forum on Enterprise 2.0, this is just outside of Milan in Varese, Italy on June 25, 2008. I am really looking forward to this event as there are many people whom I chat with on Skype with and chat with in other ways about enterprise and the use of social tools inside these organizations. It is a wonderful opportunity to meet them in person and to listen to them live as they present. Already I know many people attending the event from the United Kingdom, Switzerland, Germany, Austria, Spain, and (of course) Italy. If you are in Europe and have interest this should be a great event to get a good overview and talk with others with interest and experience. Oh, did I mention the conference is FREE? I will be presenting an overview on social bookmarking and folksonomy and the values that come out of these tools, but also the understanding needed to make good early decisions about the way forward. I look forward to meeting those of you who attend. Posted at 12:59 PM from Bethesda, Maryland. Posted at 6:49 AM from Bethesda, Maryland. Posted at 1:10 AM from Bethesda, Maryland. Comments are open (with usual moderation) at this post at Getting Info into the Field with Extension :: Personal InfoCloud. Posted at 5:26 AM from Bethesda, Maryland. 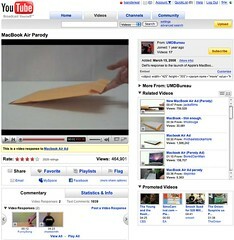 YouTube has released a new design for the site and its individual video pages. This gets shared in Google Operating System :: User Inferface Updates at YouTube and TechCrunch :: YouTube Updates Layout, Now with Tabs and Statistics. While the new design looks nice and clean, it has one design bug that is horribly annoying it has mixed interaction design metaphors for its tabs or buttons. As the image shows the Share, Favorite, Playlists, and Flag buttons or tabs all have similar design treatment, but they do not have the same actions when you click on them. Three of the items (Share, Playlists, and Flag) all act as tabs that open up a larger area below them to provide more options and information. But, the Favorites acts like a button that when clicked it marks the item as a favorite. This is incredibly poor interaction design as all the items should act in the same manner. If the items do not have the same action properties they really should not look the same and be in the same action space. Favorites should be a check box or a binary interface for on and off. That interaction patter more closely matches the Rate section and seems like it should have been there rather than showing a lack of understanding interaction design basics and confusing people using the site/service. This should have been a no brainer observation for a design manager or somebody with a design sanity check. YouTube is far from the the only site/service doing this. Nearly all of the services are not grasping the basics or are broadly applying design patterns to all user scenarios when they really do not fit all scenarios and user types (nearly every service I talk to know exactly the use type a person fits into but never takes this into account in optimization of design patterns that match that use need). Facebook really falls into this hole badly and never seems to grasp they are really making a mess of things the more features and functionality they are bringing into their service without accounting for the design needs in the interface. My seemingly favorite site to nit pick is LinkedIn which I use a lot and has been a favorite, but their social interaction additions and interactive interfaces really need much better sanity checks and testing before they go into production (even into the beta interface). LinkedIn is really trying to move forward and they are moving in the right direction, but they really need better design thinking with their new features and functionality. Their new design is ready to handle some of the new features, but the features need a lot more refining. The new design shows they have a really good grasp that the interface needs to be a flexible foundation to be used as a framework for including new features, which could benefit from treating them as options for personalization. LinkedIn has pulled back many of the social features and seems to be rethinking them and refining them, but they really need some good sanity checks before rolling them out again. The befuddled interaction understanding is not germane to commercial or consumer public social web sites, but it also plagues tools aimed at the enterprise. This is not overly surprising as many of the social enterprise (enterprise 2.0) tools and services are copying the public web tools and services to a large degree. This is a good thing, as it puts the focus on ease of use, which has been horribly missing in business focussed tools for far too long. But, the down side for enterprise focussed tools is they are not for the public web they are for business users, who most often do not have familiarity with the conventions on the public web and they have a large cognitive gap in understanding what the tools do and their value. There is less time for playing and testing in most business people's worklife. This means the tools need to get things right up front with clear understanding of the use needs of the people they are building for in business. This seems to be lacking in many tools as there is much copying of poor design that really needs to be tested thoroughly before launching. Business focussed tools are not hitting the same people as are on the web, which will work through poor design and functionality to see what things do. It is also important to consider that there are a wide variety of types of people using these tools with varying needs and varying interaction understandings (this will be another blog post, actually a series of posts that relate to things I have been including in workshops the last six months and presenting the last couple). Posted at 1:51 AM from Bethesda, Maryland. Collaboration generally means working together synergistically. If your work requires support and agreement of others before you can take action, you are collaborating. The article continues on to point out that collaboration is often not the first choice of tools we should reach for, as gathering information, understanding, and working through options is really needed in order to get to the stages of agreement. Their article digs deeply into the resolving "messy problems" through proper collaboration methods. To note, the wiki - the usual darling of collaboration - is included in their "cooperation" examples and not Collaboration. Most of the tools many businesses consider in collaboration tools are in the lowest level, which is "information sharing". But, workflow managment falls into the coordination bucket. This is one of the better breakdowns of tool sets I have seen. The groupings make a lot of sense and their framing of collaboration to take care of the messiest problems is rather good, but most of the tools and services that are considered to be collaborations tools do not even come close to that description or to the capabilities required. Posted at 5:48 AM from Bethesda, Maryland. Posted at 10:45 AM from Bethesda, Maryland. Posted at 2:29 PM from Bethesda, Maryland. I have written and posted The State of Enterprise Social Software on my Peronal InfoCloud blog as it has comments on and it also is where I am trying to keep my more professional pieces. This blog post is a reaction to Richard McManus excellent post Big Vendors Scrap for Enterprise 2.0 Supremacy. The post seemed less about supremacy than scapping to be relevant. Many of the tools I am quite or somewhat familiar with and rather unimpressed. But, go read the other post to find my assessments of the tools, but also the tools that are doing much better jobs than the traditional enterprise vendors. Posted at 4:35 AM from Bethesda, Maryland. A Stale State of Tagging? David Weinberger posted a comment about Tagging like it was 2002, which quotes Matt Mower discussing the state of tagging. I mostly agree, but not completely. In the consumer space thing have been stagnant for a while, but in the enterprise space there is some good forward movement and some innovation taking place. But, let me break down a bit of what has gone on in the consumer space. The history of tagging in the consumer space is a much deeper and older topic than most have thought. One of the first consumer products to include tagging or annotations was the Lotus Magellan product, which appeared in 1988 and allowed annotations of documents and objects on one's hard drive to ease finding and refinding the them (it was a full text search which was remarkably fast for its day). By the mid-90s Compuserve had tagging for objects uploaded into its forum libraries. In 2001 Bitzi allowed tagging of any media what had a URL. The down side of this tagging was the it did not capture identity and assuming every person uses words (tag terms) in the same manner is a quick trip to the tag dump where tags are not fully useful. In 2003 Joshua Schacter showed the way with del.icio.us that not only allowed identity, upon which we can disambiguate, but it also had a set object in common with all those identities tagging it. The common object being annotated allows for a beginning point to discern similarity of identityĵs tag terms. Part of this has been driven on Joshua's focus on the person consuming the content and allowing a means for that consumer to get back to their information and objects of interest. (It is around this concept that folksonomy was coined to separate it from the content publisher tagging and non-identity related tagging.) This picked up on the tagging for one's self that was in Lotus Magellan and brings it forward to the web. It was in del.icio.us that we saw tagging that really did not work well in the past begin to become valuable as the clarity in tag terms that was missing in most all other tagging systems was corrected for in the use of a common object being tagged and the identity of the tagger. This set the foundation for some great things to happen, but have great things happened? Del.icio.us set many of out minds a flutter with insight into the dreams of the capability of tagging having a good foothold with proper structure under them. A brilliant next step was made by RawSugar (now gone) to use this structure to make ease of disambiguating the tag terms (by appleseed did you mean: Johnny Appleseed, appleseeds for gardening/farming, the appleseed in the fruit apple, or appleseed the anime movie?). RawSugar was a wee bit before its time as it is a tool that is needed after there tagging (particularly folksonomy related tagging systems) start scaling. It is a tool that many in enterprise are beginning to seek to help find clarity and greater value in their internal tagging systems they built 12 to 18 months ago or longer. Unfortunately, the venture capitalists did not have the vision that the creators of RawSugar did nor the patience needed for the market to catch-up to the need in a more mature market and they pulled the plug on the development of RawSugar to put the technology to use for another purpose (ironically as the market they needed was just easing into maturity). The del.icio.us movement drove blog tags, laid out by Technorati. This mirrored the previous methods of publisher tagging, which is most often better served from set categories that usually are derived from a taxonomy or simple set (small or large) of controlled vocabulary terms. Part of the problem inherent in publisher tags and categories is that they are difficult to use outside of their own domain (however wide their domain is intended - a specific site or cross-sites of a publisher). Using tags from one blog to another blog has problems for the same reason that Bitzi and all other publisher tags have and had problems, they are missing identity of the tagger AND a clear common object being tagged. Publisher tags can work well as categories for aggregating similar content within a site or set of commonly published sites where a tag definition has been set (but that really makes them set categories) and used consistently. Using Technorati tag search most often surfaces this problem quickly with many variation of tag use surfacing or tag terms being used to attract traffic for non-related content (Technorati's keyword search is less problematic as it relies on the terms being used in context in the content - unfortunately the two searches have been tied together making search really messy at the moment). There is need for an improved tool that could take the blog tags and marry them to the linked items in the content (if that is what is being talked about - discerning predicate in blog tags is not clear yet). As of a year ago there were more than 140 social bookmarking tools in the consumer space, but there was little advancement. But, there are a few services that have innovated and brought new and valuable features to market in tagging. As mentioned recently Ma.gnolia has done a really good job of taking the next steps with social interaction in social bookmarking. Clipmarks pioneered the sub-page tagging and annotation in the consumer tagging space and has a really valuable resource in that tool. ConnectBeam is doing some really good things in the enterprise space, mostly taking the next couple steps that Yahoo MyWeb2 should have taken and pairing it with enterprise search. Sadly, del.icio.us (according to comments in their discussion board) is under a slow rebuilding of the underlying framework (but many complaints from enterprise companies I have worked with and spoken indepth with complain del.icio.us continually blocks their access and they prefer not to use the service and are finding current solutions and options to be better for them). While there are examples that tagging services have moved forward, there is so much more room to advance and improve. As people's own collection of tagged pages and objects have grown the tools are needed to better refind them. This will require time search and time related viewing/scanning of items. The ability to use co-occurance of tag terms (what other tags were used on the object), with useful interfaces to view and scan the possibilities. Portability and interoperability is extremely important for both the individual person and enterprise to aggregate, migrate, and search across their collections across services and devices (now that devices have tagging and have had for some time, as in Mac OS X Tiger and now Vista). Enterprises should also have the ability to move external tagged items in through their firewall and publish out as needed, mostly on an employee level. There is also desire to have B2B tagging with customers tagging items purchased so the invoicing can be in the customers terminology rather than the seller terminology. One of the advances in personal tagging portability and interoperability can easily be seen when we tag on one device and move the object to a second device or service (parts of this are not quite available yet). Some people will take a photo on their mobile phone and add quick tags like "sset" and others to a photo of a sunset. They send that photo to a service or move it to their desktop (or laptop) and import the photo and the tag goes along with it. The application sees the "sset" and knows the photo was transfered from that person's mobile device and knows it is their short code for "sunset" and expands the tag to sunset accordingly. The person then adds some color attribute tags to the photo and moves the photo to their photo sharing service of choice with the tags appended. The current tools and services need tools and functionality to heal some of the messiness. This includes stemming to align versions of the same word (e.g. tag, tags, tagging, bookmark, bookmarking). Tag with disambiguation in mind by offering co-occurrence options (e.g. appleseed and anime or johnny or gardening or apple). String matching to identify facets for time and date, names (from your address book), products, secret tag terms (to have them blocked from sharing), etc. (similar to Stikkit and GMail). Enterprise is what the next development steps really need to take off (these needs also apply to the power knowledge worker as well). The monitoring tools for tags from others and around objects (URLs) really need to fleshed out and come to market. The tag monitoring tools need to become granular based on identity and co-occurance so to more tightly filter content. The ability to monitor a URL and how it is tagged across various services is a really strong need (there are kludgy and manual means of doing this today) particularly for simple and efficient tools (respecting the tagging service processing and privacy). Enterprise and power knowledge workers also are in need of some solid analysis tools. These tools should be able to identify others in a service that have similar interests and vocabulary, this helps to surface people that should be collaborating. It should also look at shifts in terminology and vocabulary so to identify terms to be added to a taxonomy, but also provide an easy step for adding current emergent terms to related older tagged items. Identify system use patterns. We are still at the tip of the usefulness of tagging and the tools really need to make some big leaps. The demands are there in the enterprise marketplace, some in the enterprise are aware of them and many more a getting to there everyday as the find the value real and ability to improve the worklife and workflow for their knowledge workers is great. The people using the tools, including enterprise need to grasp what is possible beyond that is offered and start asking for it. We are back to where we were in 2003 when del.icio.us arrived on the scene, we need new and improved tools that understand what we need and provide usable tools for those solutions. We are developing tag islands and silos that desperately need interoperability and portability to get real value out of these stranded tag silos around or digital life. Posted at 2:18 AM from Bethesda, Maryland. As you have heard nearly everywhere else it is SXSW interactive panel picking time [had I not has the worst cold in 2 years you would have heard it here earlier]. Well, this year I am in on two panels in for the picking. Both are subjects I get asked a lot of questions about and have much experience with each. Please go vote. Posted at 6:12 AM from Bethesda, Maryland. Josh, thanks for the link. If the world of language were only this simple that this worked consistently. The folksonomy is a killer resource, but it lacks structure, which it crucial to disambiguating terms. There are algorithmic ways of getting close to this end, but they are insanely processor intensive (think days or weeks to churn out this structure). Working from a simple flat taxonomy or faceted system structure can be enabled for a folksonomy to adhere to. This approach can help augment tags to objects, but it is not great at finding objects by tags as Apple would surface thousands of results and they would need to be narrowed greatly to find what one is seeking. There was an insanely brilliant tool, RawSugar [(now gone thanks to venture capitalists pulling the plug on a one of a kind product that would be killer in the enterprise market)], that married taxonomy and folksonomy to help derive disambiguation (take appleseed as a tag, to you mean Johnny Appleseed, appleseed as it relates to gardening/farming, cooking, or the anime movie. The folksonomy can help decipher this through co-occurrence of terms, but a smart interface and system is needed to do this. Fortunately the type of system that is needed to do this is something we have, it is a taxonomy. Using a taxonomy will save processor time, and human time through creating an efficient structure. Recently I have been approached by a small number of companies who implemented social bookmarking tools to develop a folksonomy and found the folksonomy was [initially] far more helpful than they had ever imagined and out paced their taxonomy-based tools by leaps and bounds (mostly because they did not have time or resources to implement an exhaustive taxonomy (I have yet to find an organization that has an exhaustive and emergent taxonomy)). The organizations either let their taxonomist go or did not replace them when they left as they seemed to think they did not need them with the folksonomy running. All was well and good for a while, but as the folksonomy grew the ability to find specific items decreased (it still worked fantastically for people refinding information they had personally tagged). These companies asked, "what tools they would need to start clearing this up?" The answer a person who understands information structure for ease of finding, which is often a taxonomist, and a tool that can aid in information structure, which is often a taxonomy tool. The folksonomy does many things that are difficult and very costly to do in taxonomies. But taxonomies do things that folksonomies are rather poor at doing. Both need each other. I am continually finding organizations are thinking the social bookmarking tools and folksonomy are going to be simple and a cure all, but it is much more complicated than that. The social bookmarking tools will really sing for a while, but then things need help and most of the tools out there are not to the point of providing that assistance yet. There are whole toolsets missing for monitoring and analyzing the collective folksonomy. There is also a need for a really good disambiguation tool and approach (particularly now that RawSugar is gone as a viable approach). Posted at 1:00 AM from Bethesda, Maryland. s tools make that much easier and do not require expensive campuses. t have the means to capture great ideas when they occur". I am just back from Enterprise 2.0 Conference held in Boston, where I presented Bottom-up All The Way Down: How Tags Help Businesses Organize (thanks to Stowe Boyd for the tantalizing session title), which was liveblog captured by Sandy Kemsley as "Enterprise 2.0: Thomas Vander Wal". I did not catch all of the conference due to some Boston business meetings and connecting with friends and meeting digi-friends whose work I really enjoy face-to-face. The sessions I made it to were good and enlightening and as always the hallway conversations were worth their weight in gold. s worklife, information workflow, and collaboration, as well as simple instructions (30 second to 3 minute videos) and simply written clear guidelines that outline acceptable use of these tools. I have been working with technology and its adoption in corporations since the late 80s. The misperception that older people do not get technology, are foreign to the tools, and they will not ever get the technical tools has not changed. It is true that nearly all newer technologies come into the corporation by those just out of school and have relied on these tools in university to work intelligently to get their degree. But, those whom are older do see the value in the tools once they have exposure and see the value to their worklife (getting their job done), particularly if the tools are relatively simple to use and can be adopted with simple instruction (if it needs a 10 to 200 page manual and more than 15 minutes of training to start using the product effectively adoption will be low). Toby Redshaw of Motorola stated on a panel that he found in Motorola (4600 blogs and wikis and 2600 people using social bookmarking) "people of all ages adopt these tools if they understand the value connected to their work". Personally, I have seen this has always been the case in the last 20 years as this is how we got e-mail, messaging, Blackberries, web pages, word processing, digital collaboration tools (the last few rounds and the current ones), etc. in the doors of small to large organizations. I have worked in and with technically forward organizations and ones that are traditionally thought of as slow adopters and found adoption is based on value to work and ease of use and rarely based on age. This lack of understanding around value added and (as Toby Redshaw reinforced) "competitive advantage" derived from the social tools available today for use in the enterprise is driven by fear. It is a fear of control that is lost from the top-down. But, the advantage to the company from having this information shared and easy found and used for collaboration to improve knowledge, understanding, and efficiency can not be dismissed and needs to be embraced. The competitive advantage is what is gained today, but next month or next quarter it could mean just staying even. But, what really is important is the communication and social enterprise tools are okay and add value, but the fear is overplayed, as a percentage rarely occurs, and handling the scary stuff it relatively easy to handle. In the halls I had many conversations around tagging ranging from old school tagging being painful because the experts needed to tag things (meaning they were not doing the job as expert they were hired to do and their terms were not widely understood) all the way to the social bookmarking tools are not scaling and able to keep up with the complexity, nor need to disambiguate the terms used. But, I was really impressed with the number of organizations that have deployed some social bookmarking effort (officially or under somebody's desk) and found value (often great value). Toby Redshaw: I though folksonomy was going to be some Bob Dillon touchy-feely hippy taxonomy thing, but it has off the chart value far and above any thing we had expected. My presentation had 80 to 90 percent of the people there using social bookmarking tools in some manner in their organization or worklife. The non-verbal feed back as I was presenting showed interest in how to make better sense of what was being tagged, how to use it better in their business, how to integrate with their taxonomy, and how to work with the information as the tools scale. The answers to these are longer than the hour I have, they are more complex because it all depends on the tools, how they are set-up and designed, how they are used, and the structures of information inside and outside their organization. Posted at 1:54 AM from Bethesda, Maryland.